The Bois Jacques is a location where vestiges of the fighting are still visible. These excavated depressions in the land remain a poignant reminder of the brutality of the fighting which raged during the months of December 2944 and January 1945. The Easy Company and other parachute divisions stationed in the Bois Jacques were charged with stopping the German units stationed just a few hundred metres from their position to move towards Bastogne. To provide shelter from the violence of the fighting, the American soldiers had no choice but to dig « fox holes » in the ground to protect themselves from enemy fire and from artillery bombardment. Artillery fire was particularly deadly in the forest because it demolished the trees. The Bois de la Paix was created as a part of a commemoration of the 50th Anniversary of the Battle of the Bulge.  There are approximately 4,000 trees of the species which are found on the Bastogne plateau. These trees were planted in such a way that when seen from the sky they display the acronym of UNICEF: the mother and child, a symbol of universal tenderness. American veterans who returned to Bastogne each have a plaque detailing their name and unit at the foot of their tree. This cemetery was created just after the battle and contains the bodies of nearly 6,807 German soldiers and officers. Under each of the small granite crosses lie six German soldiers whose names, where known, are engraved in the stone. 1,300 unidentified soldiers lie under the distinction Ein deutscher Soldat. Originally, on the opposite side of the road, a cemetery was built for the bodies of American soldiers who fell during the conflict in the area. In 1948, American graves were transferred to other military cemeteries in Belgium, Luxembourg, France, the United States and even to Italy. In 1954, the Belgian and German governments signed an agreement giving the Volksbund Deutsche Kriegsgräberfürsorge responsibilty for maintaining German burials on Belgian territory. In the same year, development began onsite. Construction has yet to start on a fence and a chapel made of pink basalt from the Eifel region and internal walls of slate. The Recogne German War Cemetery is now registered in Wallonian public heritage.. The Bastogne Barracks has served as a World War II Interpretation Centre since 2010. During the siege of Bastogne General McAuliffe’s headquarters were located in the cellars of this military barracks. It was in this place on the 22nd December, 1944 that McAuliffe, the general who commanded the forces besieged at Bastogne, proclaimed the famous phrase "NUTS", refusing the German request for surrender and entering the paces of history forever. This site also houses the War Heritage Institute, a site dedicated to the restoration and conservation of heritage vehicles. There are in impressive number of military vehicles stored at the Barracks. This building houses the 101st Airborne Museum – The Mess which before the wary was designated the mess of the officers of the 2nd Régiment des Chasseurs Ardennais, stationed in Bastogne. Through the use of dioramas, the Museum traces the history of the siege and the Battle of Bastonge that took place during the winter of 1944-1945. On the opposite corner of the street, the building facing the museum served as the headquarters for the German armies operating in the regions in May 1940, more than four years before the Battle of the Bulge. Hitler himself visited this building on May 17, 1940 to acquire information about the progress of the battle.